If you are in the market for a mid-range Windows Phone 8 device then the Nokia Lumia 820 should definitely make your shortlist. The smartphone is affordable, fast, responsive, looks nice and comes with the Finnish manufacturer's exclusive collection of enticing apps. Users can even personalize the appearance of the Lumia 820 by switching between different back covers of attractive colors. In a number of ways, the Lumia 820 is closer to high-end rather than mid-range Windows Phone 8 devices. The smartphone comes with the same processor as the Lumia 920 (which explains the speed part), features support for wireless charging through optional back plates and sports an AMOLED display where black is really black and not a shade of gray. But, the Lumia 820 is not a scaled down version of the bigger Lumia 920 or any other high-end Windows Phone 8 handset. The Lumia 820 comes with a 4.3-inch AMOLED display with ClearBlack technology, resolution of 480 by 800 and 217 pixels per inch density. A 1.5 GHz dual-core Qualcomm Snapdragon S4 processor, 1GB of RAM and a 1650 mAh battery power the smartphone. Other specs include 8GB of internal storage; microSD card slot; 8.7 MP back-facing camera with 1080p video recording; 0.3 MP front-facing camera with 480p video recording; USB 2.0; Bluetooth 3.0; Wi-Fi 802.11 a/b/g/n; NFC; 4G LTE; magnetometer and A-GPS as the most noteworthy. The Lumia 820 comes in at 123.8 x 68.5 x 9.9 mm and 160 grams. Similar to other Windows Phone 8 handsets in Nokia's lineup, the Lumia 820 comes with an all-glass front panel and polycarbonate backside. Like I previously mentioned the back panel is interchangeable, and comes in seven different colors: cyan, purple, red, white and yellow as glossy and gray and black as matte finishes. Needless to say, there's a back panel for (almost) everyone's taste. If you still aren't happy enough, Nokia even provides a 3D printing development kit for the Lumia 820, which delivers complete customization albeit at a cost. 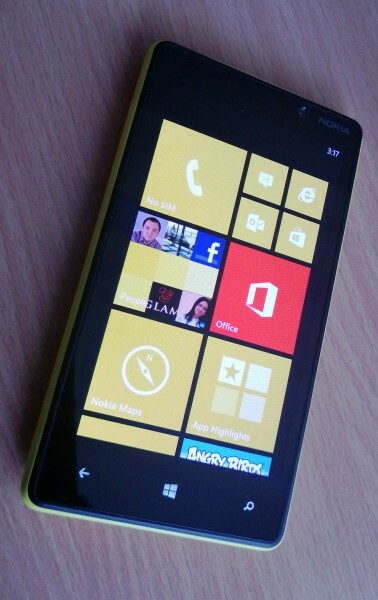 The Lumia 820 that I received for this review comes with the glossy yellow cover. The good part is that the color and the finish mask any imperfections very well, and there is the possibility of replacing the back panel to get rid of all the wear should it occur. Also, the yellow cover really makes the Lumia 820 stand out in a crowd. The downside with having a glossy finish on the back, and this holds true for every handset that I have tested, is that the smartphone can get very slippery and is more prone to drops. A matte finish partially solves the problem, albeit Nokia's respective coatings are still somewhat slippery. The back panel on the Lumia 820 flexes under pressure, something that is not immediately noticeable unless a higher pressure is applied. That said, the Lumia 820 is well built and gives the impression that it can withstand a fair amount of abuse. And, being quite small, the Lumia 820 is also easy to handle and use with one hand. The weight is not as substantial as the Lumia 920 for instance, although after using Nokia's flagship for a while nothing really is heavy anymore. At 160 grams, though, the 820 is far from being the lightest smartphone around, which is something to consider for some folks. Generally speaking the Lumia 820 does well in the design department. It's a fairly standard approach with rounded corners, non-tapered edges and significant thickness. But phone lags behind its larger brother, the Lumia 920, or the HTC Windows Phone 8X in this regard. As I mentioned in the specs, the Lumia 820 comes with a 4.3-inch AMOLED display with a resolution of 480 by 800 and a 217 ppi density. There are two notable downsides here: the resolution and, therefore, the pixel density. If you are used to looking at a display with a 720p resolution (720 by 1280) or higher, the panel on the Lumia 820 will look underwhelming by comparison. Text is not as sharp as it should be, easy to spot when looking through the app list or the Settings menu. A similar impression is given when viewing web pages in Internet Explorer. But there are good parts to the Lumia 820's display. Colors pop and appear vibrant, something which is highly noticeable when holding the handset next to the Lumia 920. That is in part due to the AMOLED technology and the software calibration performed by Nokia. All in all, except the low resolution, the display on the Lumia 820 is decent. Due to the 1.5 GHz dual-core Qualcomm Snapdragon processor and the 1GB of RAM, the Lumia 820 comes with plenty of power. Performance is good across the board, although I have noticed a couple of hiccups here and there likely due to some software glitches. 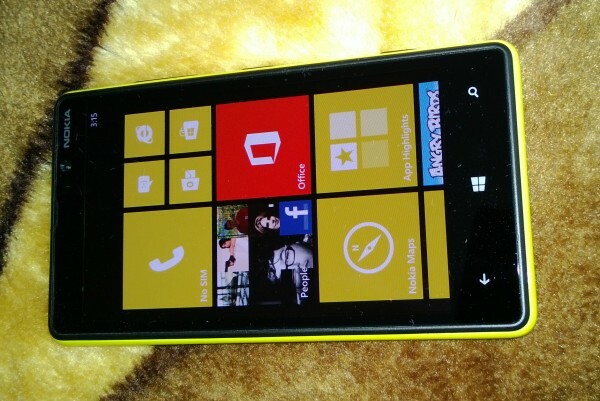 Windows Phone 8 is very responsive, fast and fluid, a trait that is common among similar devices. Browsing speeds are also good and double tap to zoom performs great with almost instant text refresh. If you care about such things, the Lumia 820 got a score of 910.9 ms in SunSpider, version 0.9.1. That's one of the highest scores attainable on a smartphone today. What about battery life? During my testing, with brightness set on auto, two email accounts, Facebook, LinkedIn and Twitter syncing in the background, mobile data and Wi-Fi always enabled, some calls and texts and an overall medium use, the battery on the Lumia 820 got me through the day and even into the next one. With light usage, I saw around 30 hours of battery life but I'm certain your experience may vary with a different usage pattern. Just like the Lumia 920, the Lumia 820 features support for wireless charging and comes with a display that can be operated using gloves. While the former may require purchasing a new part (the back panel in this case), the latter is available out-of-the-box. You'll still need gloves, obviously. I have doubts when it comes to the benefits of the ultra-sensitive display. Sure it's nice to be able to use the smartphone with gloves, but you'd have to wear thinner and grippier gloves to operate the display well enough and, obviously, hold the smartphone. To me, that's just a nice feature that I'll likely never use as it's quite difficult to take out the smartphone from inside my pants' pockets using gloves. The wireless charging feature is more useful more of the time. I have a Nokia wireless charging pillow, Fatboy-branded, which I use to top the battery on my Lumia 920. Sadly, I couldn't test this feature on the Lumia 820 as the back panel doesn't support wireless charging. That said, it should work just as on any other compatible smartphone -- just place it on top and it charges. It is worth noting that the 8GB of internal storage runs out pretty quickly when shooting video, snapping pics or installing apps. A microSD card is supported and should be acquired. The Lumia 820 can house microSD cards up to 64GB in size, which should cover even the most demanding users' needs. The Lumia 820 comes with an 8.7 MP back-facing camera, similar in count to the one on the Lumia 920, but without the Nokia PureView branding. That means no tricked out OIS (Optical Image Stabilization) or impressive low-light performance. Pictures are of decent quality, although they do not impress overall. The shots feature a decent level of detail, though not up to par with photos shot with the Lumia 920, for instance. Also, under low-light, the camera makes too much use of flash, which makes pictures look overexposed in the focus area, but underexposed otherwise. The video camera also captures decent videos, but like previously mentioned without OIS. That means videos appear slightly shaky when you move. By contrast the Lumia 920 fares better in this regard. The camera also adapts slower than it should to light changes (the Lumia 920 again fares better). Sound is decent overall, but is high-pitched. By contrast the Lumia 920 delivers a more muffled sound. For a mid-range device, generally speaking both the photos and videos produced with the Lumia 820 are decent. If you are not a photography enthusiast this smartphone's back-facing camera should suffice most of the time. About the 0.3 MP front-facing camera, let's just say that it's there and leave it at that. The low quality of the latter is to be expected considering the megapixel count. It is worth noting that the Lumia 820 review unit that I have comes with Windows Phone version 8.0.10211.204 and firmware version 1232.5957.1308.0001, both latest available at the time of writing this article. Nokia may tweak the camera software in future releases, so your experience can vary depending on the firmware. In the software department, the Lumia 820 offers pretty much the same apps and features as the 920. The only apparent difference, and this may boil down to this particular software version, is the more restrictive screen time-out intervals -- the Lumia 820 tops at five minutes, while the 920's display can be kept on until the battery runs out. Otherwise, you're looking at the same level of software equipment. You can read my comparison between the Windows Phone 8X and the Lumia 920 as well as my Lumia 920 first-impressions review for the scoop on some of the most important Nokia-branded apps. Needless to say you will not be disappointed by the Nokia collection inside Windows Phone's app store. There are plenty of useful apps ranging from maps, navigation, photo editing, games, weather, sports, shopping to social networking (Nokia's Foursquare app for instance). This one is a tough nut to crack. In Europe, the Lumia 820 is available at roughly the same price as the Windows Phone 8X, when purchased off-contract. The latter, however, is HTC's Windows Phone flagship and features better hardware specifications, albeit lesser software prowess. You'll have to choose which one really matters to you: hardware or software. If the latter is the case then the Lumia 820 is best, otherwise go for the Windows Phone 8X. In the United States, for instance, the Lumia 820 can be had with no upfront cost upon signing a two-year contract with AT&T. Verizon, which sells the Lumia 822 -- a branded version of the Lumia 820 -- also offers the smartphone for free. At this price-point the Lumia 820 and its Lumia 822 sibling offer unbeatable value for the money in the Windows Phone realm. But, if you're on AT&T and plan on staying there for another two years I advise you to pony up for the Lumia 920. It runs for $99.99 on a two-year contract and offers more bang for the buck: bigger and higher resolution screen, better cameras, better build quality and, dare I say, better looks (I know that is subjective). Nokia really improves the Windows Phone 8 experience with the Lumia lineup. The added apps bring real value to the mix, something that other manufacturers should pay attention to even in mid-range to low-end market. The Lumia 820 also never once felt underpowered or out of its element. I appreciate the extra dose of excitement brought by the yellow trim and the other colorful back plates, which almost makes me regret getting a Lumia 920 in boring black. The Lumia 820 is likely the best mid-range Windows Phone device currently available. The only things that really let it down are the average back-facing camera and low-resolution display, the latter of which is easily noticeable more of the time than the former. If you are willing to put up with these two shortcomings, the Lumia 820 can pretty much do everything that the Lumia 920 does only at a lower price-point.